This is a very popular dish to make in the winter time with produce from the stores. *The acidity of sauerkraut varies very much and homemade is often not as acid. *Rinsing bottled sauerkraut before use will lower the acidity. *The amount of sugar you add to the dish is a personal preference – if rinsed 1 tablespoon should be enough – if not rinsed you might need 1 -2 tablespoons more. Drain the sauerkraut and keep the liquid ( you may want to use it to adjuct the acidity of the dish later ). Rinse the sauerkraut with cold water. 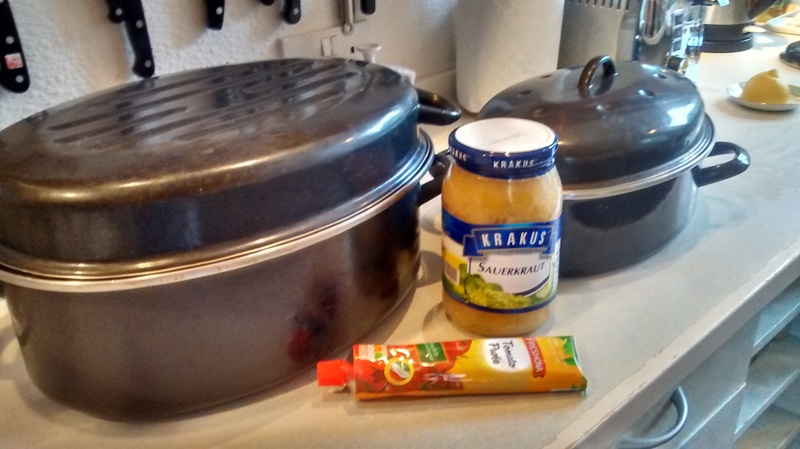 Place the sauerkraut in a large saucepan and pour boiling water over it until it just covers it. Bring to the boil and then cover the saucepan with a lid and let it gently simmer for around 10 minutes. Continue heating either gently on top of the stove or put the pan with the lid into a low to medium oven. Cook for around another 30 minutes until the sauerkraut is soft. Remove the pan from the heat and add the caraway seeds – put the dish back into oven or keep on the stove with the lid on. Chop the bacon into small squares and heat gently in a frying pan to release the fat. Chop the onions into small pieces and add them to the pan and fry the onions until they are golden. Sprinkle the flour over the onions and heat gently to brown the flour. Add spoonfuls of liquid from the sauerkraut mixture to the onion mix. Stir and heat to form a thickening roux/paste. Add this to the sauerkraut mixture and mix throughly. Put the pan back in the oven for around 10 minutes – or heat gently on the stove. Sprinkle ground black pepper on the top before serving. 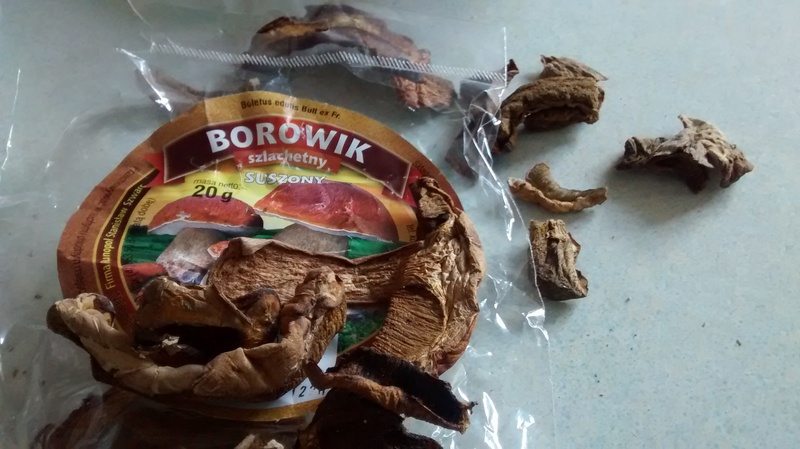 Serve with rye bread or boiled potatoes and hot roast pork or cooked Polish sausages. Served on Carnation by Royal Doulton, 1982 – 1998. Bigos is often called Poland’s national dish. It is Poland’s sweet and sour dish using sweet (fresh) cabbage and sour(fermented) cabbage (sauerkraut). This is a smaller, quicker version than the traditional bigos recipe. I often make it somewhere in between the traditional recipe and this quick recipe as all the amount are very flexible. If you can only get large jars of sauerkraut then you can put half the contents into a plastic bag or box and freeze it for later use. note – salt should not be needed as the sausage and bacon contain salt. Finely chop the fresh cabbage into long strands and place in a large pan with the sauerkraut. In a jug mix the tomato purée with some hot water and then add this to the pan. 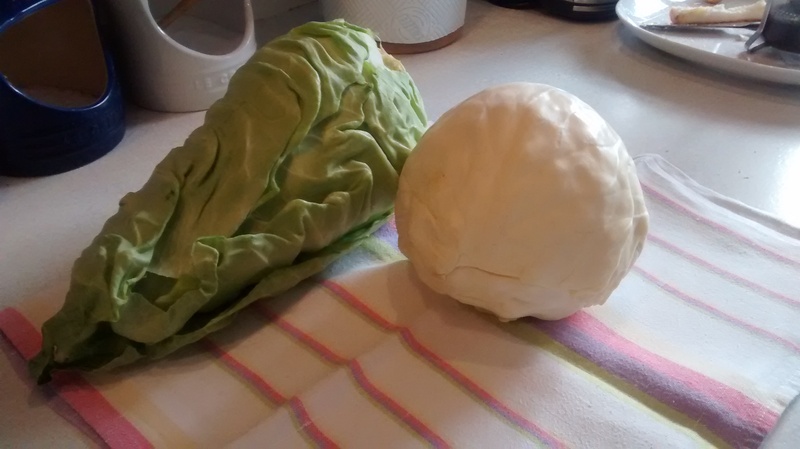 Add more boiling water to cover the cabbage mixture. Add the bay leaves and peppercorns and then boil gently till the cabbage is becoming soft. Slice up the various smoked sausages, chop the bacon into small squares and add to the cabbage mixture and boil gently till everything is soft. 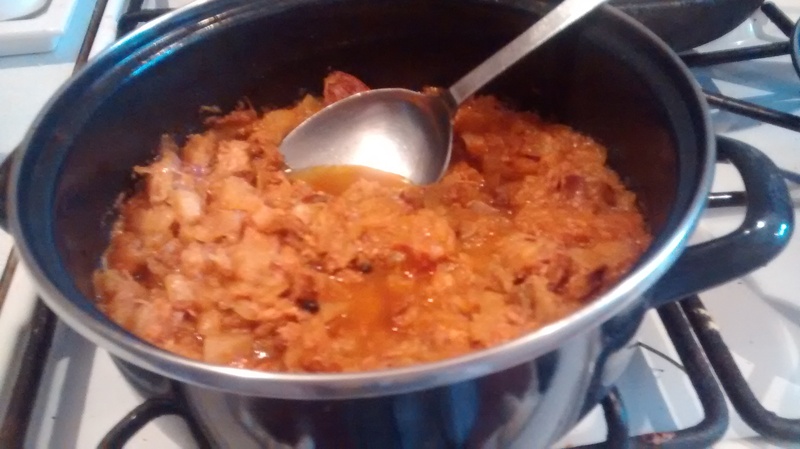 Chop the onion into small pieces and fry till golden, add the flour and fry till the mixture is just about to burn and then add this mixture to the bigos. Adjust the sourness to taste with sugar and or lemon juice. Now you can either heat it all together gently over a low heat with a lid on the pan, stirring the mixture occasionally or put the mixture into a large oven proof dish (I use an enamelled dish) with a lid and put it in the oven at GM 4 – 180oC for about 2 hours. 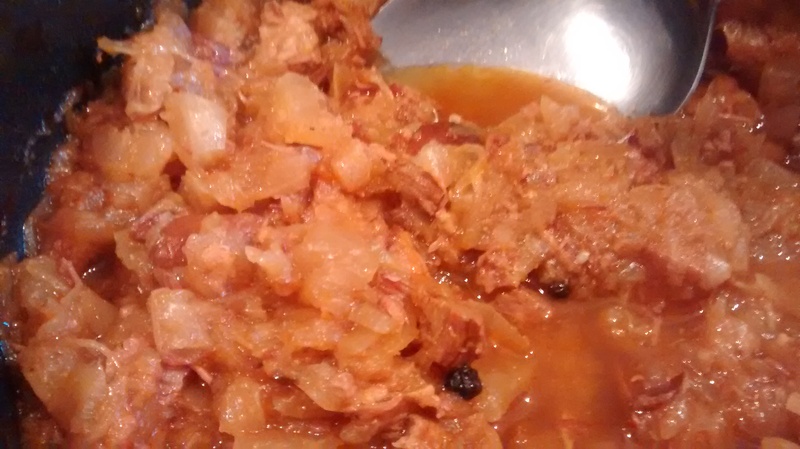 Bigos tastes better if made one day, left overnight, and then reheated in a saucepan or in a dish in the oven. 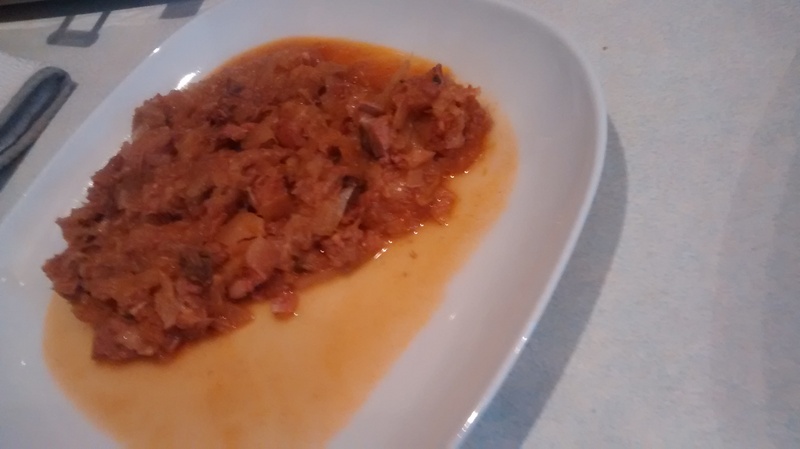 Bigos freezes well – I portion it up into manageable portions which will serve 2 or 3 – wrapping it in plastic bags within a plastic box to prevent the tomato staining the plastic. Bigos is usually served with rye bread but I often serve it with boiled or mashed potatoes. Bigos is often called Poland’s national dish. It is served at every large gathering: christenings, weddings, funerals and every other excuse for getting together for food and drink. It is best made in advance by at least a day and then reheated. My father used to talk about using a horse and cart to take large wooden barrels of bigos to where there was going to be a celebration. It is Poland’s sweet and sour dish using sweet (fresh) cabbage and sour (sauerkraut) cabbage. How sweet and sour you make it depends on taste, I always use roughly equal amounts of fresh and sour cabbage – a large white cabbage to a large tin or jar of sauerkraut. You can add sugar or some lemon juice to alter the sweet/sour balance. This was a Hunter’s stew with all the meat and game that was available in the long hard winters going into the pot with the cabbage. A variety of mixed fresh and smoked meats and sausages are used, the amount can vary with how much meat you have. Served with rye bread with or without butter and a glass of beer or vodka, it is delicious. The mixture of cabbage and tomato in bigos is very Polish, as a little girl I thought that cooked cabbage was always orange to red rather that pale to dark green as my mother always used the two together in all her cabbage recipes. Tomatoes were brought to Poland in the 16th century by the Italian chefs who came with the Italian Princess Bona Sforza who married the Polish King, Zygmunt the Old. The Polish word for tomato – pomidor, shows its Italian origin. I have many of these enamel pans they are good for slow cooking in the oven. There are lots of variations you can make to the following recipe and everyone seems to have their own version. I find the following proportions work out very well every time and the bigos is moist but not like a soup. This makes a large amount which is good for a family gathering. 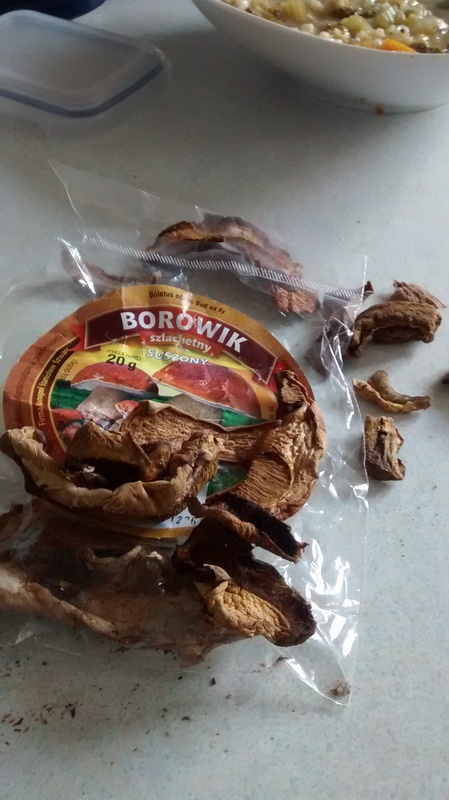 Often I make this in advance and then portion it up into 4 parts and then pack these into large plastic bags or tubs and freeze them – so I always have some on hand. Note – the tomato stains the plastic tubs so I often put a bag inside a tub. I also then wrap the tub in another bag as the aroma is strong even when frozen and this stops it affecting other food in the freezer. Put the sauerkraut in a large pan and add boiling water until it is covered and boil gently for 1 hour till it is soft. 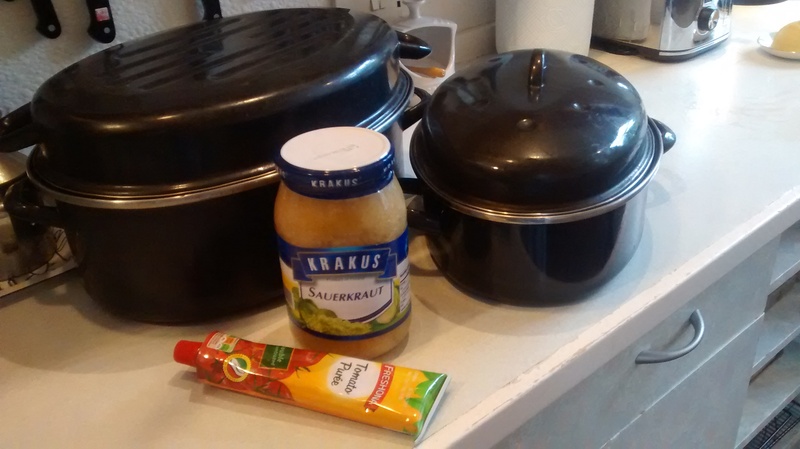 Take care not to let it boil dry and push the sauerkraut down occasionally so it stays under the water. Finely chop the fresh cabbage into long strands and place in another large pan with the dried mushrooms, add water to cover the cabbage and boil till soft and as with the sauerkraut take care it does not boil dry. Chop the pork into small cubes and fry till brown on all sides. Chop the bacon into small squares. Add 100g of the bacon and all the pork to the sauerkraut and boil gently till everything is soft. Make crisp skwarki* with the rest of the bacon and add to the sauerkraut. Chop the onion into small pieces and fry till golden, add the flour and fry till the mixture is just about to burn. Add the cooked fresh cabbage with all the liquid and the fried onion mixture to the sauerkraut. Slice up the various smoked sausage and add to the bigos. Add the tomato purée, bay leaves and peppercorns. You can add some sugar or lemon juice at this stage; this depends on how sour you like the bigos and often depends on the sauerkraut used. I rarely do either of these. Now you can heat it all together gently over a low heat with a lid on the pan or put the mixture into a large oven proof dish; I use a large oval enamelled dish, and put it in the oven for about 3 hours. Bigos tastes better if made one day, left overnight, and then reheated in the pan or in the dish in the oven. *skwarki – small squares of bacon fried till the fat comes out and you are left with little crisp bits.